Gestern war ich nicht so ganz bei der Sache. Ich habe einen Beitrag über Johannisbeergelee gepostet, aber es nicht mehr geschafft, den deutschen Eintrag fertigzustellen. Damit habe ich sowohl das H als auch das I überschlagen. Mit I habe ich leider nichts im Angebot, aber dafür wird heute das H nachgeliefert. Hefeschnecken gibt es ja wie Sand am Meer. Ich esse am liebsten Mohnschnecken. 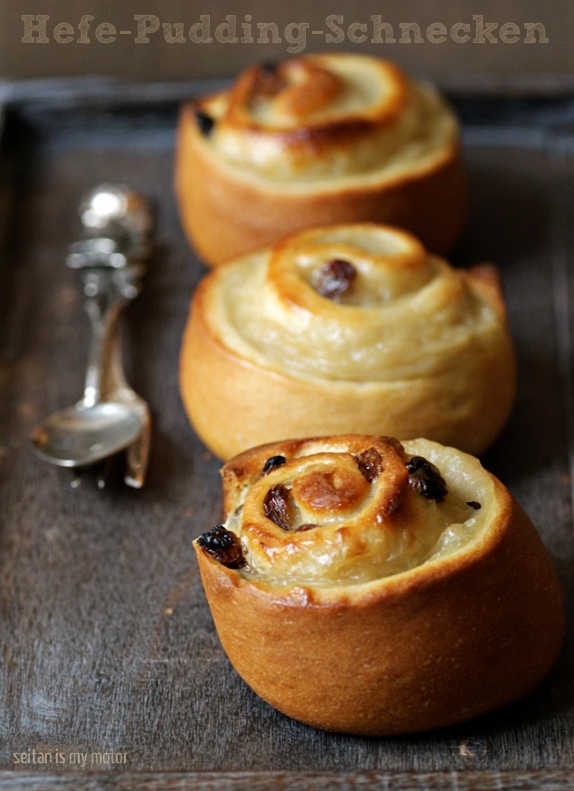 Für Puddingschnecken hatte ich bisher kein Verständnis. Wieso tut man bloß überall Pudding rein? Für den Vegan Month of Food habe ich mir überlegt, mal ein bisschen über den Tellerrand zu schauen und habe deshalb Hefeschnecken mit Pudding gemacht. Und war positiv überrascht. Ich habe mich mal wieder an ein Dr. Oetker-Rezept gehalten und das einzige was mir nicht gefallen hat war, dass diese Schnecken wirklich sehr süß sind. Um das auszugleichen würde ich das nächste mal vielleicht etwas Zitronensaft und Zitronenschale zur Füllung geben. Milch und Öl in eine Schüssel geben und kurz mischen. Die übrigen Zutaten dazugeben und alles zu einem glatten Teig verkneten. Abdecken und 60-90 Minuten gehen lassen. Das Teigvolumen sollte sich in dieser Zeit verdoppeln. Sojamilch, Stärke, Zucker und Vanille in einen kleinen Topf geben. Zum Kochen bringen und kochen bis die Mischung ganz zäh ist. Wenn Ihr denkt „Oh, das kann ich nicht mehr essen!“, ist es wahrscheinlich gerade richtig. Das sollte sehr schnell gehen, nach 1-2 Minuten ist der Pudding fertig. Beiseite stellen. Ofen auf 200°C vorheizen und zwei Backbleche mit Backpapier auslegen. Den Teig rechteckig ausrollen (30×20 cm). Pudding darauf verteilen. Das wird wahrscheinlcih etwas schwiereig gehen, da der Pudding so zäh ist. Dann die Rosinen darauf verteilen und den Teig von der längeren Seite aufrollen. In 2 cm breite Schnecken schneiden und auf die Backbleche legen. Nochmal abgedeckt 30 Minuten gehen lassen. Ungefähr 15 Minuten backen. Abkühlen lassen und servieren. 1. Dough needed a lot more milk and oil, I had to add about 1/4-1/3 cup more milk, a tablespoon more oil and I still think maybe I should have added a bit more. 2. Pudding: Proportions are good except I added only 2 1/2 tablespoons of sugar. On execution however, I changed the whole thing. I first made it by the recipe and got gobbs and liquid, I guess as described. So I made a second batch: I set 3/4 cup of milk to boil in a saucepan with vanilla and sugar. I reserved the other 1/2 cup of milk in a large cup and added corn starch to it, mixed it well (!!!) and stirred it into the boiling mixture, stirring constantly over small heat for ~2 minutes till thickened. I got a beautiful thick and creamy pudding. Hi Ola, thank you for your feedback! The dough recipe has worked for other US people before but I think there can be huge differences in flour quality. US flour might have more protein and that’s why sometimes you need more liquid. That’s great, River! Thank you! You should let it cool to room temperature. Thanks for catching that! Beautiful rolls! I imagine they’d be messy to roll up but so worth any effort they may take! Custard sounds like a amazing addition to soft fluffy buns. It wasn’t that messy! The pudding is rather solid and won’t spread much at that point. Oh Mihl, I missed this post yesterday! These little buns look so totally like something I would love, and I haven’t had a treat like this for so many years. The raisins and the pudding… Oh heavy sigh. They are beautiful! I wish I was your next door neighbor… I would knock on your door every day and beg for treats! Hey, it’s good to keep readers on their toes! See who’s paying attention! I love schnecken, but I’ve never made them. Thanks for the motivation! and I love when words are the same in various languages; it makes me smile. Wow, Germany sure knows how to make the most delicious baked stuff ever! Of course we forgive you, lovely! I just finished my dinner and I thought I was stuffed, but I could so eat a bunch of these right now. They are beautiful! I would definitely prefer to eat one of these rolls than to eat a slice of cake! I didn’t notice you getting the wrong letter yesterday anyway. These look perfect. I used to adore those danish pastries with a custard filling and these remind me of them. yummy. I always buy yeast and it goes off in my pantry! Such a waste, I obviously need to make more sweet yeasty things! Just plain gorgeous. I’ve really loved your recipes during this Mofo. My family is German, and I’ve always wanted to veganize more German desserts for dinners with my Oma. She has a ton of cookbooks, but they’re all in German and I don’t even know where to start. This series has been really inspiring. I’m looking forward to more! Thank you! I wish I could help you with those cookbooks. Me too! She has a million of them and they look amazing. Oh yummy! This looks so appealing to me and I am going to make it this weekend! Would you be terribly offended if I left out the raisins? nach poppy seed rolls hatte ich natürlich nicht gesucht…. really, I think these are my favourite of your Vegan MOFO’s yet. I have read the recipe twice and stared for far too long at your photo. I am lusting after one now. I’m going to buy yeast tomorrow. I love how you compare baking with yeast to making a cake. Great points!! I only finally baked with yeast this year and I felt so accomplished afterward! I am looking forward to trying these!